How far away is the Orlando International Airport from the campus? Is there parking at the USTA Campus? Complimentary surface parking is available. Do the hotels provide shuttle service to the USTA campus? Residence Inn & Courtyard by Marriott Orlando Lake Nona and Holiday Inn Express & Suites Lake Nona provide complimentary shuttle service to/from the Campus. Where is the closest grocery store or pharmacy? Publix at Lake Nona Creekside located at 14185 Lake Nona Blvd, Orlando, FL 32824. 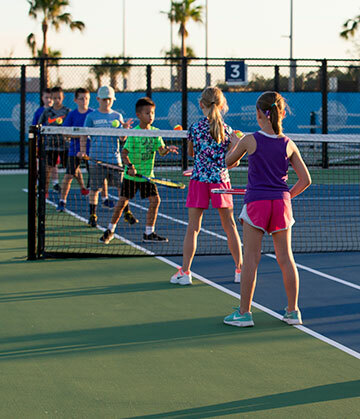 Can you get food at the USTA Campus? Net Post Grill is located in the Welcome Center is open seven days a week. Are racket repair services available? The USTA Racquet Bar provides stringing and repair services. They are located in the Welcome Center.